Worcester boss Dean Ryan says that "anything can happen" in their fight for Premiership survival if his side can maintain their recent form. The bottom club's hopes of avoiding relegation improved after a weekend in which they narrowed the gap on 11th-placed Newcastle to seven points. "We've three games left and two of them are against some of the best sides in the Premiership," Ryan told BBC Sport. "But we're now playing some decent rugby - and anything can happen." Warriors' narrow 17-12 win at Newcastle a fortnight ago - their first Premiership win in over a year - offered the chance of an unlikely escape route. And although Ryan's men then lost on Saturday, their two bonus points from the 38-33 home defeat by Exeter - one of which was for scoring four tries for the first time this season - maintained their belief that they can avoid the drop. The feeling of optimism at Sixways was then enhanced when Newcastle returned pointless from the Madejski Stadium on Sunday, having gone down to a 40-12 defeat by London Irish. Ryan's one chief plea to his team is to somehow narrow the gap on Newcastle over the next two matches to five points or less, to ensure that Worcester can at least keep alive the season until the final weekend. Prior to hosting Ryan's old club Gloucester on the last day of the regular league season on 10 May, Warriors' next two matches are both away from home. To add to the size of the task ahead, those two away trips are against two of the Premiership's top four, Bath and Saracens, both of whom will be fired up to win themselves as they chase end-of-season honours at the top end of the table. But team spirit at Sixways is buoyant and Ryan argues that the form the Warriors have shown over the last two months - earning narrow bonus-point defeats against Leicester, Harlequins, Wasps and Exeter, as well as beating Newcastle - has made them far more of a force to be respected. 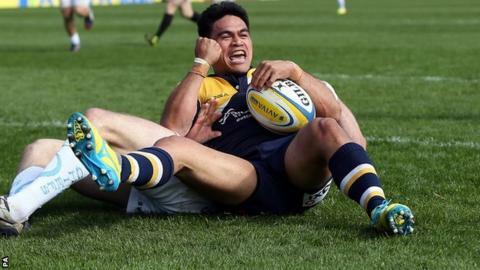 "I think we've been a great team for two or three months," he told BBC Hereford & Worcester. "The key is being able to transfer that team into being a winning team. "That means you've got to get your job right within that group. "We've shown great heart, we've shown great work-rate and we're starting to get a real good understanding of what we're trying to do. "London Irish went and won at Saracens and nobody expected that. "We've got three games to go and we're not going away."